SIXTEEN people are dead, 24 are missing and at least 300 are trapped by devastating mudslides which oozed their way through a wealthy neighbourhood in California. 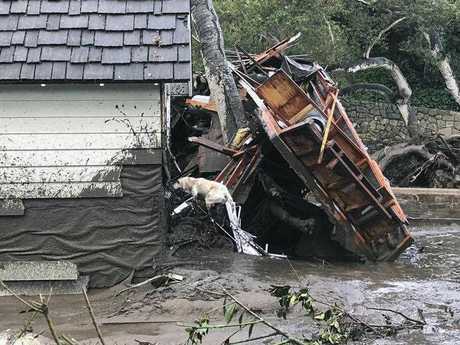 In this photo provided by Santa Barbara County Fire Department, Santa Barbara County Fire Search Dog Reilly looks for victims in damaged and destroyed homes in Montecito, Calif. following deadly runoff of mud and debris from heavy rain on Tuesday, Jan. 9, 2018. Just weeks after raging wildfires forced them to leave their homes, residents of the area to the east of Santa Barbara were being urged to leave after a deluge of mud, ash and boulders were unleashed by a ferocious storm. In one story that details the extent of the scenes, one rescue worker who thought he was picking up a 'muddy doll' from the debris discovered it was actually a toddler. The girl, 2, was taken to hospital with a hip injury but has survived the ordeal. 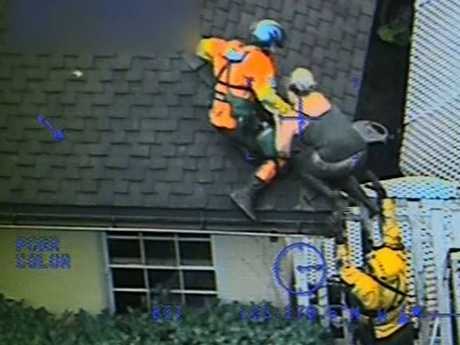 A family of five were also plucked from the debris of their home in a dramatic rescue. 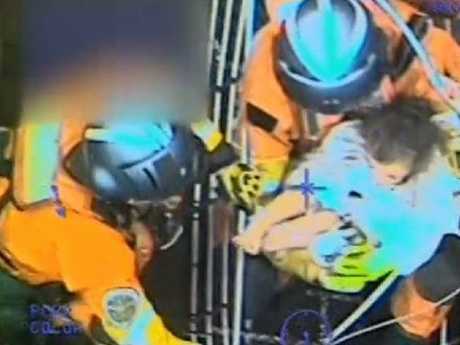 The couple and their three children - a seven-year-old boy, three-year-old girl and a baby - were rescued by the US Coast Guard in Carpinteria, a small oceanside city located in southeastern Santa Barbara County. One of the crew's rescue swimmers Erin Custer told Fox 5: "The first floor of their house was about three, four feet (90-120cm) of mud, so they were having to wade through. Celebrities who have properties in the area have also been affected. Oprah Winfrey's $50 million home was damaged but survived the onslaught. She told her instagram followers: "Thanks everyone for your prayers and concern. My property is fine. Some mud, and minor damage that pales in comparison to what my neighbors are going thru. #mudslides"
Rob Lowe told his Instagram followers he was "under mandatory evacuation orders again". Lowe, who also has a home in Montecito, wrote on Twitter he was "mourning the dead in our little town tonight". The death toll climbed as emergency workers pulled bodies from the river of knee-deep debris which descended on the community of Montecito and the surrounding Romero Canyon area after a torrent of rain earlier in the week. Boulders as big as cars were seen rolling down the hillsides during the deluge. Homes and historic hotels were battered or swept away altogether. Hillside vegetation which would have ordinarily impeded the mud had been stripped away during the wildfires last month. Hundreds of residents remain trapped and authorities are working on an evacuation plan. Many of them had ignored earlier orders to get out. Emergency services attributed this to 'evacuation fatigue' after last month's fires. Bridget Bottoms, a resident who chose to stay, appeared to confirm their fears, declaring: "It sounds foolish but … how bad can it get?" About 7000 residents in Santa Barbara County were ordered to evacuate before the downpour on Tuesday, and another 23,000 were urged to do so voluntarily. \Only days after her glamorous appearance at the Golden Globes, Oprah Winfrey shared a video of her home to let her followers know she was safe and her property had survived. She stood in mud as she said she was 'devastated' by the damage to her neighbour's house. 'Thanks everyone for your prayers and concern,' she wrote. As many as 24 people remain unaccounted for, said Chris Elms, a spokesman for state firefighters. He added: "We are still very much in active search and rescue mode." A girl of 14 was freed after firefighters heard cries for help from what was left of her home. "I thought I was dead there for a minute," Lauren Cantin said after workers spent six hours digging her out. Santa Barbara County Sheriff Bill Brown said of the devastation: "It looked like a World War One battlefield. It was a carpet of mud and debris." The storm came after a 10-month dry spell following torrential rains in January and February of last year.